Positioned in the fantastic rolling Sussex countryside with panoramic views The Hayloft is a self contained first floor loft set within 2 acres of grounds. Ideally situated for walking, cycling and many other country pursuits. Close to the South Downs and the south coast, all of which have much to offer. Good access to extensive footpath and bridleway network outside the front door. 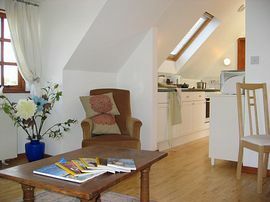 Awarded a 4 Star grading by the Tourist Board, the Hayloft provides accommodation for up to four people consisting of open plan living/dining room complete with sofa bed, separate double bedroom, kitchen and bathroom. At ground level there is a boot/drying room with laundry facilities and outside its own garden and parking area. 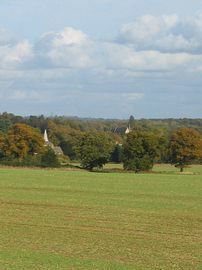 The Hayloft is in West Grinstead, a hamlet just south of Horsham. Brighton, Worthing and Arundel are all within easy reach, and Gatwick Airport is only twenty minutes by car. Direct trains to central London from Horsham. The Hayloft is situated within the grounds of our family home, yet is totally separate, self contained and private with its own private entrance and internal stairs. Open plan living/dining room with sofa bed, dining table and chairs, TV, freeview, DVD & video player. Triple aspect with extensive views. 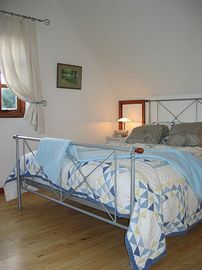 Large double bedroom with double aspect, stunning views, TV and DVD player. Galley kitchen with oven, hob, microwave and fridge. Bathroom bath with shower attachment, heated towel rail. Ground floor entrance with access to boot/drying room with washing machine, tumble dryer, freezer and drying space for drying/storing walking boots and coats. Heating by night store heaters with boost facility. Outside private secure level parking area. Own garden overlooking adjoining arable farmland with garden furniture and BBQ. Secure covered cycle storage available by arrangement. Welcome local produce provision basket on arrival. Tesco/Sainsbury/Ocado home grocery deliveries can be received in advance of your stay. Fantastic views over beautiful countryside. Direct access to miles of off road walking and cycling. Private garden and patio area overlooking adjoining farmland with fantastic views. Take A24 southbound from Horsham towards Worthing. You will reach a major set of traffic lights at Buck Barn Crossroads (A272 junction). Continue southbound and after approx � mile you will see a turning to the left (after speed camera) signposted West Grinstead and Partridge Green IGNORE this turning but stay in the left hand lane. After another � mile take the next turning left into Rookcross Lane. Follow the lane around the corner and where it forks keep to the right. Rookcross Barn and The Hayloft are the 2nd property on the left hand side at the top of the hill. Prices £340.00 - £445.00 per week. "Wonderful place to stay!" We really enjoyed our stay at the Hayloft, with its clean, comfortable accommodations; wonderful views overlooking the countryside; and great walks in the area. Kirsty and her family were terrific hosts -- and Connie, their dog, welcomed us home every day when we returned from our excursions. 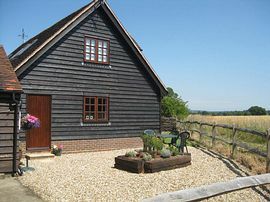 "Delightful Hideaway Home in West Sussex" My family and I stayed at the Hayloft for a week in July 2009, and are returning again for a week in 2010. We found the accommodation beautifully furnished, comfortable, well-equipped and clean, and we appreciated such touches as the welcome basket, fresh flowers, week-long weather forecast and file of brochures on local attractions. My five-year-old son enjoyed the rural location and seeing the family's horses in the stable yard. Kirsty and her family were friendly, helpful and accommodating hosts. 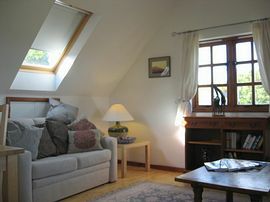 I have no hesitation in recommending the Hayloft to other visitors. "Fantastic" The service was excellent, the facilities were fantastic, especially for a young family. The place was immaculate and the family so friendly and helpful. The Hayloft was the perfect location for us for all the places we wanted to visit, including Castles, Fishbourne and Brighton. It was great for us to be away from the busy road and see the wildlife. Would recommend to anyone. "Lovely vacation home" The service was excellent, we got all the information and help we needed. The accommodation was great, everything you need is present. The location is perfect, it has a tremendous view. There are plenty of public footpaths to explore the beautiful countryside. There are lots of things to do. The host is very friendly and helpful, and makes you feel right at home. I can name no drawbacks.